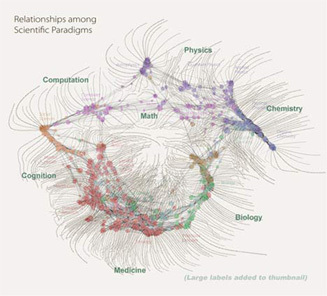 As to what the image depicts, it was constructed by sorting roughly 800,000 scientific papers into 776 different scientific paradigms (shown as red and blue circular nodes) based on how often the papers were cited together by authors of other papers. Links (curved lines) were made between the paradigms that shared common members, then treated as rubber bands, holding similar paradigms closer to one another when a physical simulation forced them all apart: thus the layout derives directly from the data. Larger paradigms have more papers. Labels list common words unique to each paradigm. It tickles my sensawunda node that we can now visualise our understanding of the physical universe in this way. Look at the map in close-up here. You can see the great flowering coagulations of health, medicine, cell biology, and biochemistry. And brain research in the midst of a three-way tug-of-war between computer science, social science, and the study of the central nervous system (which is winning). I wonder what this map will look like in a hundred years? with engineering details of construction ,energy and mass transit system.